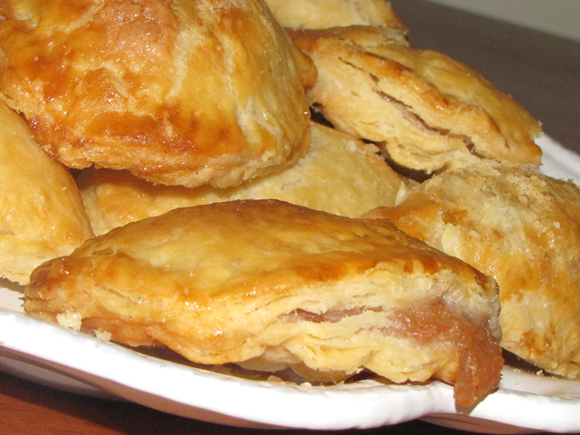 Because I love making cute, little food, I whipped up these adorable little hand pies one afternoon. I made up my pie dough - which was way easier than you think - and got to work on cutting out and filling the little pumpkin shaped pies. There's also the opportunity to get the kids involved with this one because you can use cookie cutters to get different shaped pies. Let's start with the dough. Making your own pie dough/crust is surprisingly easy. Of course you can go and buy the pre-made sheets at the store, but they never seem to be flaky enough and they usually taste pretty bland. If you decide to mix up your own though, it's as easy as throwing everything into a food processor or mixing everything with a spoon. 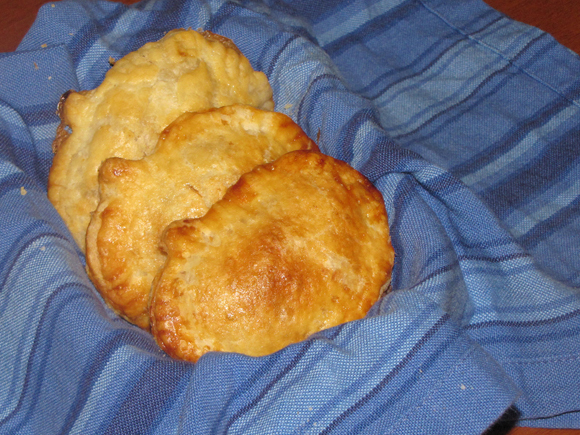 The end result will be worth it your own because the crust is so flaky, so buttery, and just soooooo good. 1. Mix flour, sugar and salt together in processor or large bowl with a fork. 2. Cut butter into small pieces and work into the flour with your fingers or a pastry cutter - or pulse a few times in the processor. Leave some irregular sized pieces. You want a breadcrumb consistency with some larger pieces. 3. With the fork, mix while slowly pouring in half the water - or slowly pour in half the water while pulsing. Add a little more water if necessary until it forms clumps and holds together. You may or may not need all the water. 4. 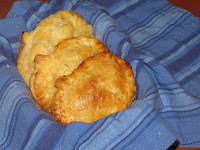 Divide the dough into two discs for two single/one double crusted pie or smaller discs for mini/hand pies. 5. Wrap in plastic wrap and chill for at least 30 minutes or until firm. This dough is great for so many things and adds such a rich, deep flavor to whatever you make. (I even made a batch to use for some strombolis and it was awesome!) It's perfect for rolling out for the standard pies and works great for mini pies. I had some apple pie filling left from canning last year so I decided to make up the little pies to use it up and spend a nice baking day with my son. He had so much fun making them and even more fun eating them! 2. Roll out discs into 1/4" thick and use a large circle cookie cutter to make rounds. If using specialty shapes, cut out as desired using one piece for the top and one for the bottom. 3. 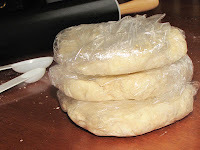 Depending on the size of your circle, place 1-2 TB pie filling on one half of the circle and fold over the other side. Press edges together with a fork. If cutting out shapes, place filling the the middle of one, brush the edges with water, and place second shape on top. Press edges together to seal. 4. Make a small slit on top to vent the pies and place onto parchment or foil-lined baking sheet. 5. Whisk the egg with 1 TB water and brush over the pies.